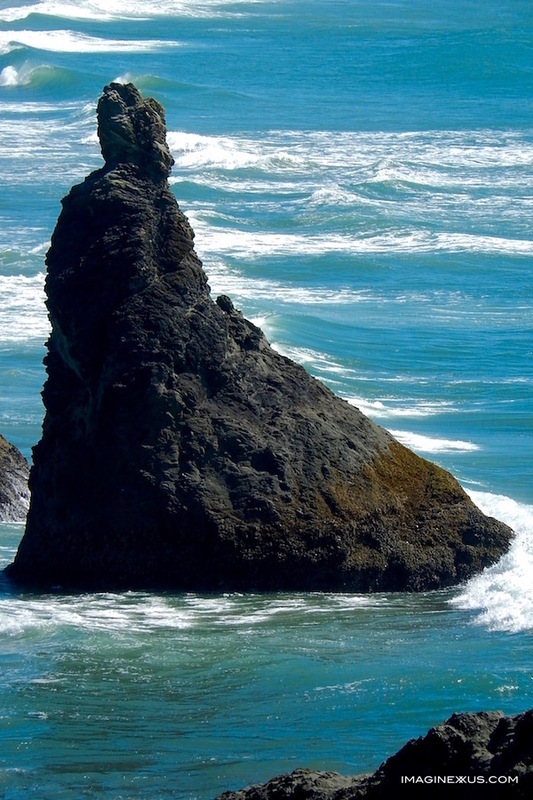 Fascinating Monoliths in Bandon, Oregon: Sea Stack Gazing — . One advantage to Oregon’s beaches being car-free is that we have the chance to take leisurely strolls. There’s zero traffic to worry about—unless you count an occasional sand crab dancing sideways across the sand or a rambunctious golden retriever. This carefree atmosphere allows visitors time to walk past and contemplate what the sea stacks look like. It is like cloud watching in reverse. There’s no better place to gaze at sea stacks than in the town of Bandon. Unlike Cannon Beach to the north that has only one big rock to stare at, Bandon has over two dozen of all shapes and sizes. Perhaps its most famous is Face Rock with the well-defined forehead, nose, mouth and chin on the right side. Yet, a case can be made for it to be called Janus Rock, with a second face on the left that reminded us Alfred Hitchcock. Our favorite sea stack was the one we named the Buddha Rock. He sits peacefully with a ushnisha atop his head, surrounded by waves and looking across the ocean towards the Far East. If you enjoyed this story in our series, you may also enjoy two other Oregon coast stories about Haystack Rock and Heceta Head Lighthouse. We also encourage you to check out any of our books.